2draw.net - boards - Beginner - Birdie. So, after a very long time of indecisiveness, I finally get myself to draw something. And it's THIS. 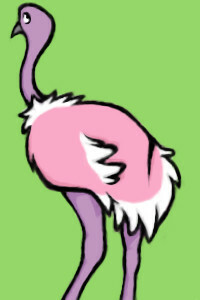 Some strange ostrich thing. To be colored momentarily, I just wanted to sumbit the linework in case I want to copy it over to Photoshop at any time. : Sometimes simple backgrounds are better. I love your smooth lineart. :D Nice ostrich/emu thingy. and my graffiti would set it off! I don't know what to think of it. But I like the thing anyway. It looks as though it is in leauge with the evil Pink Giraffes!!! Anyhoo, I love the simplicity of the picture, and the feathers just look awesome. Your work is always great to see! hey...three VV's in a single session..I'm glad you're drawing! !